Wondering what to say, how to help, and/or what to know about your friend with cancer? Now, for the first time, your questions will be answered in this supportive and instructional guide on how to be there for your loved one in his or her time of need. 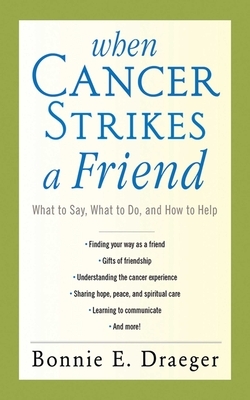 When Cancer Strikes a Friend is a prescriptive, step-by-step guide with menus of tried-and-true responses, bulleted examples, detailed sidebars, and sound advice from cancer professionals. In Bonnie Draeger’s debut book, professionals provide authoritative treatments of topics, including post-treatment; when friends live alone; pediatric and teen cancer issues; talking to children about cancer; and food, teamwork, and more. Featuring more than forty expert contributions, When Cancer Strikes a Friend is the essential guide for friends and colleagues who truly want to help their friends and family—acting as caregivers, listeners, and supporters—fight a winning battle against the Big C.
When Cancer Strikes a Friend is the essential book for anyone who knows someone with cancer—that is, everyone.